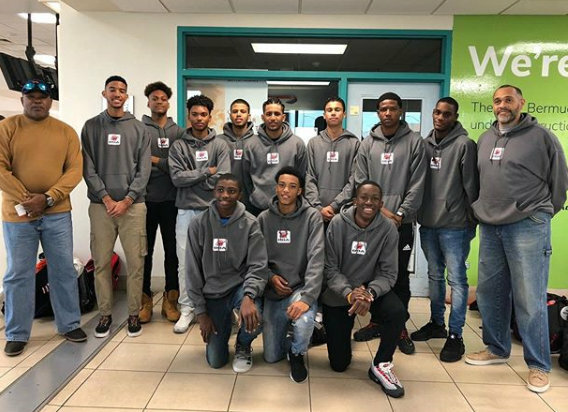 The Bermuda Basketball Association’s Under-19 team continued competing in the Heartlake Winter Classic in Brampton, Ontario, Canada. Game 2 was a game that the Bermuda Under 19 team could have taken advantage of but they went down 39 – 33 to Brampton Christian. With the exception of one player, the team matched them in height and speed. The team noticed immediately that their opponent was an average perimeter shooting team with limited ball handlers. While Bermuda was not able to take advantage of this in the first half, they were able to disrupt the other team’s offense with pressure defense. Unfortunately, the shooting woes for the Bermuda Under 19s continued, as a team, they shot a Field Goal percentage 46%, but their 1-9 from 3 point range brought the total FG% down to 37%. In the second half, the Bermuda Under 19s were able to force turnovers while at the same time reducing their turnovers (18 total) Players were more aggressive going to the basket and the pressure defense accounted for at least 5 steals and a number of forced turnovers. The Bermuda Under 19 team would take a 1 point lead into the last minutes of the game but they were unable to maintain and were forced to foul in order to stop the clock. The Bermuda Player of the game was Adam McDonald who not only led the team in scoring, also displayed excellent decision making and ball handling. His aggressiveness allowed him to attack the basket, almost at will, while at the same time, use his dribble penetration to get the ball to open teammates. Honorable mention went to Keishun Swan and Jermayne Dears.